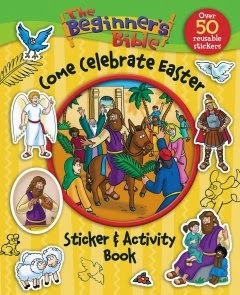 Easter will be here before you know it, so I was thrilled to receive The Beginner's Bible Come Celebrate Easter. This book is an excellent educational book that takes children from the time that Jesus entered Jerusalem to when he returned to Heaven. This book is easy for children to comprehend and for early readers to read on their own. The stickers are an added bonus in the book and makes it a bit more fun! The activities are fun and age appropriate and both of my boys have enjoyed working on this book together (they are ages 2 and 7.) While this book is only sixteen pages and can be done pretty quickly by most children, it is still a fun activity book with word searches, color by number activities, handwriting exercises, mazes and very shirt stories. At less than $4 with free shipping with amazon prime, this is an excellent choice for Easter Baskets this year! This is perfect timing. My grandsons have started asking questions and my daughter & I were wondering what we could get for them to read and actually understand. Thank you so much for posting this. i like this bible. for kids to learn aboutthe real reason for easter, it works well. the activities are a good bonus too, keeping the kids entertained. Wonderful, I love this. I think the kids would enjoy it too.